Would you believe me if I told you that a small group of indigenous corn farmers from southern Mexico are responsible, at least in part, for movements like Occupy Wall Street in the United States, Spain’s Indignados, and Direct Democracy Now in Greece? Wondering what could possibly connect corn farmers in Mexico with unemployed urban youth in Madrid? Well, to find the answer, you’ll have to turn back the clock 25 years and revisit the Zapatista uprising in the state of Chiapas. January 1, 1994, was the day humble corn farmers took up arms and said “Basta!” (“Enough!”). These rural “campesinos” had had enough of feeling ignored, slighted, robbed from and, in their own words, “dispossessed” by the Mexican government. They officially declared war. Thousands of “faceless” (masked in balaclavas) indigenous men and women carrying automatic weapons took control of dozens of towns and cities in southern Chiapas, including San Cristóbal de Las Casas, the capital city. The impetuses for this call to arms were many, but the biggest was the recently signed NAFTA treaty between the countries of North America. Opening up the borders for free trade, to the Zapatistas anyway, meant the rich were going to get richer and the poor, poorer. These high mountain communities in southern Chiapas could not afford to get any poorer. They were already suffering. We do not take up arms for the pleasure of killing and dying … For our sons and daughters, there are no schools or medicines; there are no clothes or food, there is no decent roof above their heads. For our children, there is only work, ignorance, and death. The land we have is useless … We, their fathers, mothers, brothers and sisters, didn’t want to carry the guilt of doing nothing for our children. We searched for peace and ways to obtain justice, but we found only death; we found pain and sorrow, every time. And then, we had to turn to the way of war, because what we asked for with our voices was not heard. In their declaration of war, the Zapatistas’ demands were simple; land, food, a home, health, and education. The most basic of human rights. They went on to outline more demands, not only on behalf of their own population, but on behalf of all Mexican people – democracy, freedom, and justice, as well as basic human rights that they demanded be extended to all peoples regardless of race, class, or ethnic origin. Compare those demands from 25 years ago to more recent issues raised by participants in movements like Occupy Wall Street and Direct Democracy Now and you’ll see striking similarities. They almost all focus on economic inequality, employment, housing, government policies that favor the rich and overall poor economic conditions. Issues aren’t the only thing these movements have in common. They also have one other huge factor in common with the Zapatistas, organization. Almost every one of these modern social movements has modeled its grassroots organization and mobilization after the uprising in 1994. Today, some may say that the Zapatista movement has been largely unsuccessful. But, while their efforts did not change the face of Mexico at large, they have radically changed the sociopolitical face of the land the Zapatistas now govern autonomously, independent of the Mexican government. While never declaring outright independence from Mexico, the Zapatistas did demand autonomy in the forms of land access and use of natural resources, effectively taking back their livelihoods. 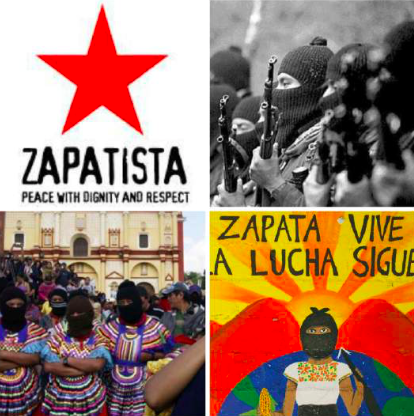 Today, about 60,000 Zapatistas now live in these autonomous municipalities, called caracoles. And really, that’s what is at the heart of all modern day liberal movements: more “say” in how decisions are made and policies are handed down, and giving the power back to the people. But, for all their freedom and autonomy, are the Zapatista people better off than they were 25 years ago? Well, in addition to their own system of democracy, they have a highly organized system of community mutual aid that contributes to the running of their own schools, health care clinics, and agro-ecological networks. They promote gender equality with a Women’s Revolutionary Law, and anyone over the age of 12 can, and does, contribute to communal decision-making and oversight. Community works are decided on and implemented by everyone. If any member is negligent in his or her duties or is in disagreement with the collective decision, they simply say: “Well, my friend, this is not the place for you …” Then, I assume, they are kindly shown the way out of Zapatista territory. They keep to themselves, high in the mountains of Chiapas, reject any assistance from the Mexican government and still wear their signature balaclavas when outsiders are around. Even 25 years later, they remain the “faceless,” surrendering individual identity in favor of the greater good – the whole. While the Zapatistas may not be thriving in the way they had hoped, at least they are no longer suffering under the government control they rebelled against 25 years ago. They won the right to determine for themselves how best to thrive, and they put that power firmly in the hands of the people.